My (slightly older) system really doesn’t do it justice, but this perch really makes sense for a Whispering Air Spirit. It’s still hard to get to, but some times you just have to stop and smell the (virtual) roses. Again, these guys are like alien invaders or something! They’ve got nothing to talk about except how cool it is to experiment on the native wild life. 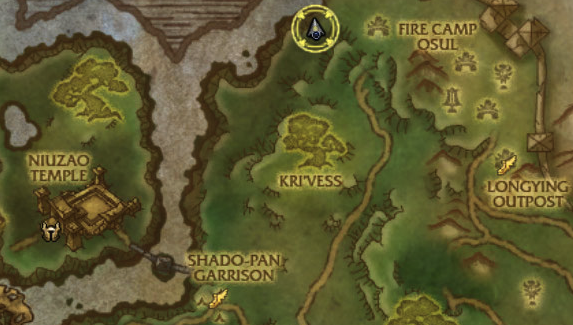 Considering how much fun the spirits were in the Pandaren leveling area, it’s kind of a let down. Oh well, at least the pets look cool! Meet Dusty. Yet another Critter experiment gone wrong. Dusty is a moth crossed with a critter. Unlike a Wolpertinger, which has a mix of Flying, Critter, and other abilities, this guy just does Flying damage. 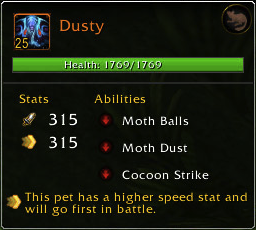 If you’ve fought a Moth before, you know how annoying Cocoon Strike can be, but his additional speed debuff from Moth Balls makes it very likely that you will always be slower than him. This can make it harder to keep your rotation going. Fortunately, his abilities all have cooldowns, so there is at one turn in his rotation where he just sits there and lets you hit him. The best pet to use against him is a Dragonkin with a Beast attack, though any Dragonkin with a heal (or a shield ability) will be equally strong. If you can time your hard hitting abilities around the Cocoon Strike, then almost any pet with a Beast attack should do well against him. He’s much less annoying than the Critter pet. Whispertail is a Dragonkin that does Flying damage. I can’t say I’ve seen very many of them before. That being said, all of his attacks are just normal Flying attacks. Stick a Dragonkin or a pet with Humanoid damage on him and you should be able to weather the storm. 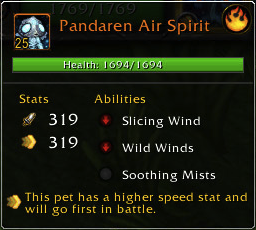 Pandaren Air Spirit doesn’t hit very hard, but it has a strong heal and can outlast your pets. Especially if you have any weather effects that boost healing. But again, 100% Flying damage, so just stick a Dragonkin with a heal and maybe Tail Swipe and you’re good to go. In summary, this fight is easy if you have one or two Dragonkin, especially ones with healing. The Tamer’s first pet can be the most frustrating, but if you time your abilities right, it can be taken down without too much trouble. The rest are just easy mode as long as you have anything that matches up with them. Use Aquatic pets carefully, though. You’ve just defeated your last Tamer! So yeah this is pretty easy. 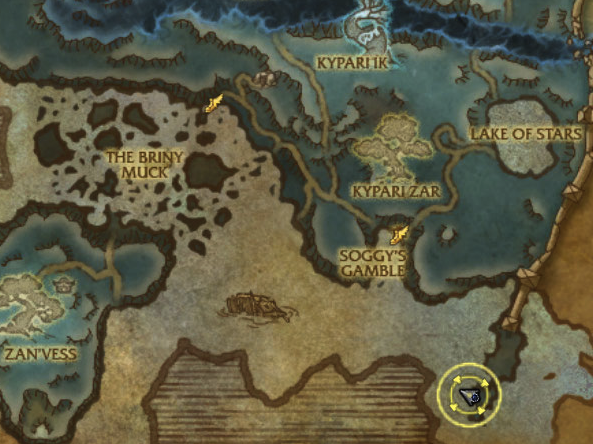 Open with your leveling pet, bring any two good Dragonkin and run it like any other fight! Good choices are: Spawn of Onyxia, Emerald Proto-Whelp, Nether Faerie Dragon, Celestial Dragon, &co. If you’re unsure of your choices or want to try something new, you can pretty much solo the fight with an Emerald Proto-Whelp using Emerald Presence and Emerald Dream, so bring that along as a safety net and test away! Patch 5.3 is almost here. So, I’m reluctant to do a step-by-step for the Beasts of Fable until those changes hit. You don’t really need a guide for those, but it’s fun to swap strategies and break out those pets that maybe you don’t use as much. I had fun writing this guide and I hope it was fun and maybe helpful for you all to read it. Feel free to comment or contact me, and I’m sure I’ll have more to say about pet battling very soon! Happy Hunting! we get to visit a cliff right on the edge of nowhere! Actually, it’s kind of a nice place to visit. You got lots of water, and the ocean, and some more water, and a few rocks to look at. Not sure I’d want to live there though. 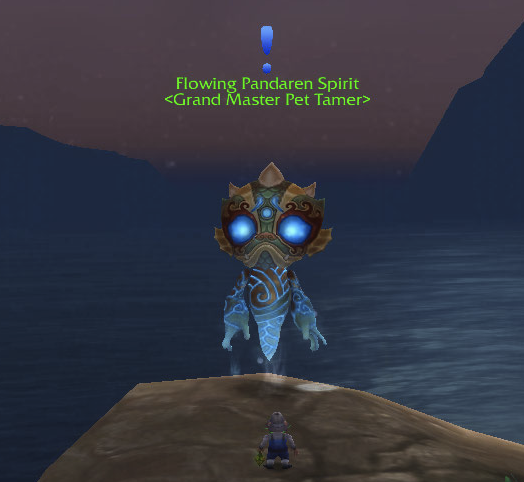 Why so blue, Flowing Pandaren Spirit Tamer? So yeah, this guy is a big blue mystery, wrapped in an enigma. Why does he hang out on this cliff giving big bags of goodies to people? Does anyone else get thirsty looking at this big walking, talking water feature? At least he occasionally drops a cool pet! 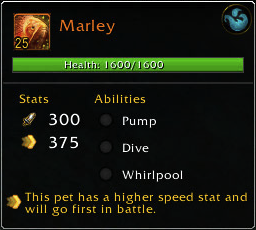 Marley has three big Aquatic damage abilities. He opens with Whirlpool which hits your pet after 3 turns with a snare and a fairly large amount of Aquatic damage. Then he Dives below your pet and hits it with another large Aquatic hit. Finally, he pumps and shoots a huge amount of Aquatic damage right after his Whirlpool goes off. This can quickly kill most pets. While it’s often best to pick a Flying damage pet and burn down Aquatic pets, in this case you’re much better off with a Magic pet. Preferably one with an avoidance ability or else a heavy hitter. Some good options include: Nordrassil Wisp (or any of the Lanterns), Enchanted Broom, or Arcane Eye. 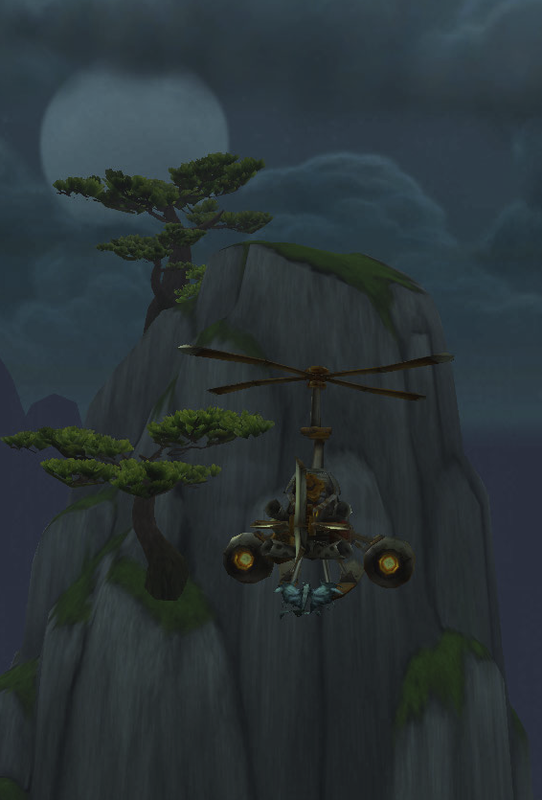 While I’m sure you can pick a Flying pet that will work, especially one with Lift-Off, there’s a relatively small window where you can hit the pet without avoidance, and a little bad RNG can sink you. 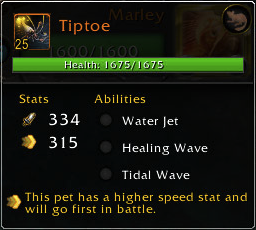 Yet another “experimental” pet, Tiptoe is a Critter that does pretty strong Aquatic damage. But nothing too heavy, just the usual Heal + Water attacks. Tiptoe does have Tidal Wave and he uses it often enough that you generally can’t get away with casting Cyclone or other attacks that can be swept away. Your best bet, again, is a Magic pet, though only a few Magic pets, like Jade Owl, do Beast damage. Tiptoe doesn’t have any avoidance abilities so any hard hitting pet also works well, especially one of the Oozes. Avoid Elementals even more than you normally would with an Aquatic damaging pet. 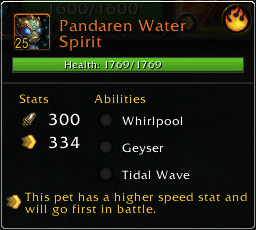 This Elemental pet drops both a Whirlpool and a Geyser and they’re timed to go off at the end of the same turn. Use either a strong Magic damage pet, or a pet with very good avoidance otherwise you won’t be able to survive. This pet uses Tidal Wave too so watch out if you have any low health pets in the back row, especially Elementals. In summary, a mix of Magic pets with healing or absorb abilities and pets with good avoidance is important to winning this battle. The burst damage these pets do make it very difficult to try and just burn them down with Flying damage. But if you have the right pets and use their abilities to counter that burst, it’s not very difficult. This fight can be very easy to do for leveling purposes as long as your pet can survive 5-7 hits with Tidal Wave, and most pets 10+ can. My usual choices are a Festival Lantern or similar pet with Flash and Blind, and an Oozeling. 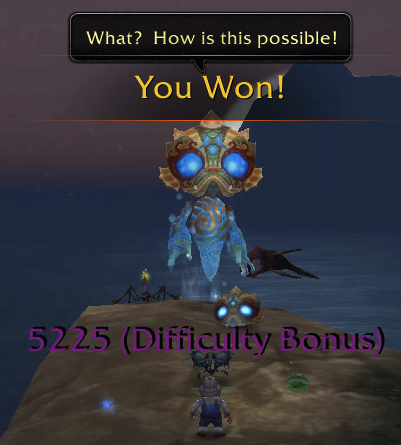 I usually open with my leveling pet, as the Tamer’s Aquatic pet does no damage its first turn. I then swap to my Lantern pet, and Blind it when it comes out of its Dive. Then I use Flash and my other ability and keep the rotation up until the Aquatic is finished. My first pet is nearly dead by the time the Critter pet comes in, so I just keep up my rotation and then swap in the Oozeling. The Oozeling’s dots take out large chunks of health and its absorb also gets buffed so I rarely go below 80-90% health before the Critter pet is dead. That’s a good thing because the Elemental hits for a Ton with it’s two delayed abilities. You usually have time to get your pet up to 100% before your pet is stunned and gets hit with 900+ damage. But by that point, the DoTs have nearly killed the Elemental as well, and you’ve just got to hit it a couple times and you’ll win. Collect your shinies, take in the scenery a bit, and enjoy the extra fast leveling! These Spirit Tamers know all of the good scenic, out of the way locations! The next Spirit Tamer is a bit easier than the previous one, but still a little tough. There is definitely more than one way to do this fight that works, I’m just showing you what I tend to use. It may take a few attempts if you want to try something new. On the bright side, you get a much better view than before while you’re figuring out the best way to take this guy down! 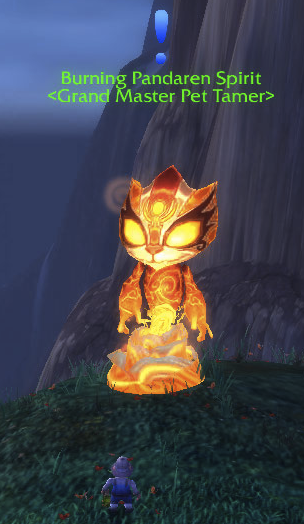 Burning Pandaren Spirit Tamer is oranger, and slightly more on fire than other Spirit Tamers. I don’t know what to say here. Burning Spirit Tamer is on fire? And it looks like it’s got a cat’s head. Maybe? They seem to have no personality. It’s like an invasion of Vulcans, if Vulcans were 10 feet tall, on fire, and loved to play WoW-Pokemon! For being all pyro, Crimson sure does alot of Flying damage. Depending on what you start out with, you’re likely to get Crimson first. Crimson’s first move is Cyclone which is designed to cut down any Aquatic pets you may be hiding back there. He then flies into the air with Take-Off which does more Flying damage. Then he hits you with Breath, which is a normal Dragonkin attack, until Cyclone is off of cooldown and he starts all over. What you use, depends on your stable. It’s a very good idea, if you can, to open with a pet that has Tidal Wave (or its Elemental equivalent) as this can get rid of Cyclone immediately. You can then swap to a Humanoid pet that has Deterrence. This should allow your Humanoid to completely avoid getting hit by Lift-Off. The ideal pet for this is Anubisath Idol as you can also pop Sandstorm and keep your back line from taking additional damage from Cyclone should Crimson use it again. I’ve also done well with Flayer Youngling. I’m sure other hard hitting Humanoids can also do well, even if they don’t have Deterrence. Pandaren Fire Spirit is pretty much Fel Flame with a huge heal. Or I guess Lava Crab with Immolate. It has a large amount of burst damage from the Immolate + Conflagrate combo it does and can also uses Healing Flame after to cancel out a big hit. If your first pet has Deterrence you should leave it in there for a bit. After the first Immolate, the Elemental always does Conflagrate and you can use Deterrence to cancel that out. 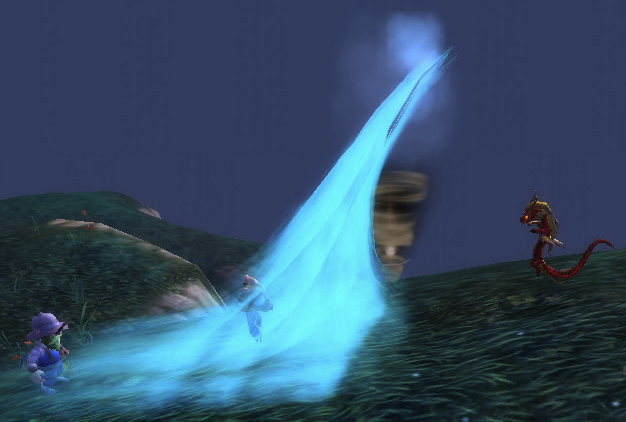 You should then bring in your Aquatic damage pet to burn through the Elemental. If you find that you’re taking too much damage from Cyclone you can use Water Waveling or a Snail pet as an alternative to an Aquatic pet. However, you will need at least one pet with a shield ability (or Sandstorm) to take out the last pet and a Crab or Turtle work very well at that. It kind of depends on how quickly you can kill that Dragonkin and what you’ve levelled. 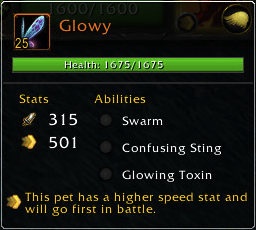 Glowy is EZ Mode if you have a pet with a blocking ability. Its abilities do almost no damage and if your pet has a self-heal you can actually finish with almost full health. Oh hai there! Have you met my uber-leet Crab yet? In summary, you need a Humanoid, an Aquatic damage pet, and a pet with a Blocking ability to take this fight down. Look through your stable and figure out what you have that works and you’ll have the fight beat. You can use this for leveling without really adding much difficulty. It mostly depends on your stable. Just remember that your leveling pet should have enough health to last through up to two Cyclones. I tend to open with my leveling pet. You then swap to your Dragonkin killer just like I mentioned earlier. I can’t tell you how much easier this is if you have Anubisath Idol. It’s super-easy mode since Sandstorm will keep your back pets from dying as well as allow you to take on the Flying pet without any trouble. But other humanoid pets work well too. The main thing is to kill the Dragonkin as quick as you can so you don’t have the Cyclone killing your back line. 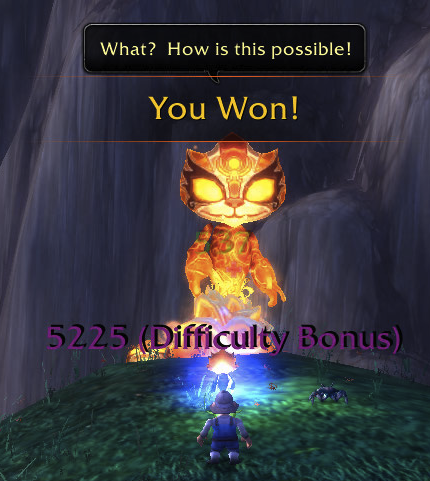 After that it’s easy as long as you have a good Aquatic damage pet to take on the Elemental. 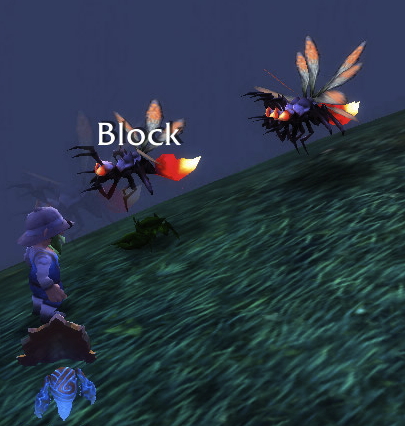 Then use your block pet to finish the fight. Eh, who needs a map anyways? It’s sort of on a shelf between the Horde shrine and the Palace. The first Spirit Tamer may be conveniently located, but it’s not the easiest to start off with. It took me awhile to unravel this fight, but once you understand how it works, it’s not so bad. Again with the research! Only instead of Mad Scientist Laboratory, I’m going with Alien Invasion? Still these guys look pretty cool, as does the pet they give you. This one is probably the most boring of the four, but it’s still not bad! 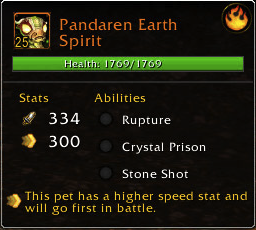 Pandaren Earth Spirit is usually the opening pet. And he’s very annoying. First he stuns you with Crystal Prison, then his next attack (Rupture) hits very hard and has a chance to stun. Finally, he just lobs rocks at you until his other attacks are off cooldown. Before the last patch, he actually had a chance of stunning your pet twice in a row. So annoying. The counter to both the stun and the massive amounts of Elemental damage he does, is to use a Critter. One that does Aquatic damage (which would be a Snail) is very good, arguably the best option as its Absorb will let you have a fair amount of health at the end of it. If you haven’t leveled a snail yet, you can do well with a Critter that has a speed > 300 or some kind of speed up ability. This keeps you from losing even one turn to the stun. I originally started out with a speed breed Brown Marmot with Burrow and Crouch. You can also get by with a Rabbit or a Prairie Dog type that has a slower speed and Adrenaline Rush. It can even be an advantage if you time your Burrow so that your speed buff wears off while you are underground as the Elemental will miss both attacks. Another pet I had great success with was an Armadillo Pup with Thrash, Roar and (especially) Powerball. The speed increase + the Beast attack allowed me to dispatch the first pet and get in a few good hits on his second pet, which made things much easier. He’s a bit of a pain. Sludgy is a Critter that does Magic and Aquatic damage (just like an Ooze). I see what they mean about “reasearch purposes.” as you can’t really find a pet like that in the rest of the game. Sludgy starts out with Expunge which hits like a truck, but has a moderate chance to miss. If you’re using anything other than the Snail as your first pet, this often kills it. Way to take one for the team little guy! The best counter for this is a Mechanical Pet that does Beast damage. A Mechanical Squirrel with Thrash, Overtune and Wind-Up is my usual choice. While you can do well with the other Mechanical pets that do Beast damage (like Fluxfire Feline) having a Wind-Up in your pocket to open with on the next pet makes things that much easier. 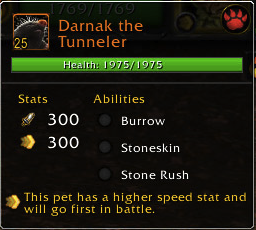 Darnak the Tunneler or as I prefer to think of him, Gimmick the Wonderpet is a Beast pet that does Elemental damage. So that means he hits for a ton, and hits extra hard below 50% health. He’ll beat up Mechanical pets with his Elemental attacks, and he also does enough Beast damage with Burrow that you have to be careful using a Critter pet. A Mechanical pet on a suicide mission can finish him off, but you need to make sure and have another pet left over or else the fight ends as a “draw” which really means you lose. That’s where having your previous pet get a few good hits in can make all the difference. You can also use a Critter as long as you make sure and time any avoidance abilities, like Dodge or Crouch, to avoid his Burrow so that it doesn’t kill you. His Stone Skin also makes it bad to use small attacks like Flurry or Swarm, so you’re stuck with mostly basic Critter attacks. The only good news is his Stone Rush does a fair amount of damage to himself, so you can get by just outlasting him with a “Tanky” pet like a Crab or a Spawn of Onyxia as long as you have avoidance abilities and time them right. In summary, this guy has three annoying pets that have an unusual mix of abilities. 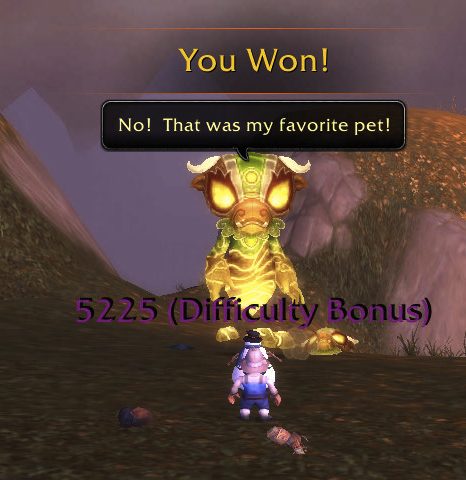 You need to have an answer for each pet if you want to win. Even the right strategy can sometimes get derailed by RNG. The fight is doable, but you need to come prepared! Well, that wasn’t so bad. Was it? I bet you thought I wouldn’t do one of these! Well it really is possible to do this for leveling purposes without too much frustration. I wouldn’t recommend bringing a leveling pet in the single digits, as it needs to take at least one good hit, but Level 10 and up is okay. First, you will need any of the three Critter pets to make this work. I’m sure someone with Uber-Leet skillz could break out a special pet and do this, but they’re teh awesome-sauce already and aren’t likely to be reading this anyways! Second, you likely need a leveled up Mechanical Squirrel. I haven’t tried it with a Fluxfire or one of those others, so it might work for you, but the combination of Overtune and Wind-Up work very well in finishing off the last two pets. You likely need to open with your Critter. If it’s a Snail, take the first stun, send out your Acidic Goo and then Dive. If your Dive hits, the Elemental will have just lost ~40% of its health. Suddenly, things seem like EZ-mode! If it doesn’t hit, just keep going with your normal rotation as your Absorb should keep you in the fight long enough to get another Dive going. If you’re using an Armadillo, you likely want to Powerball twice so that you’re faster than both the first and second pets, then break out your Roar and Thrash the Elemental to death. Depending on RNG, your pet may have very low health, but it should get the first Thrash off on the second pet before it gets killed. The strategy for a Marmot or Prairie Dog is similar to the Armadillo. Depending on whether you decide to use Crouch or not, you may have more health or less, but you’re not likely to get even one hit on the second pet unless its Expunge misses. Don’t worry about it as your Squirrel can take that pet. 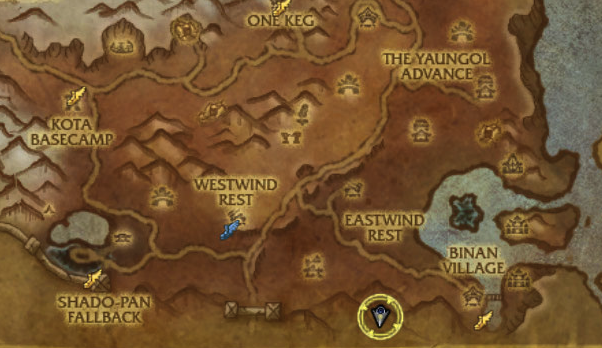 Here’s where things get interesting, because you need to decide exactly when to swap in your leveling pet. If your pet can survive Creeping Ooze, you can go ahead and swap it right in after your Critter pet. 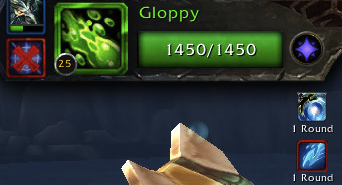 Otherwise, you’ll want to swap it in after the Tamer uses Creeping Ooze but before Expunge comes off of cooldown. Now it’s time for your Mechanical Squirrel to do its thing! You want to start with Wind-Up then you’ll go with Overtune. After that, you should use Thrash and kill that weird Critter pet! 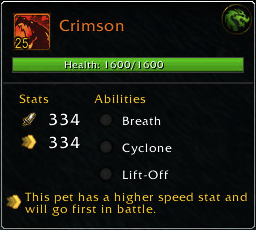 Important: at no time when fighting the Critter pet should you let your speed buff fall off! Always renew it at 1 Turn left. This way when the third pet comes up, you are able to drop a Wind-Up on it before it has the chance to put its shield up! 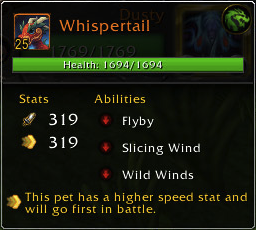 Open with a Wind-up on that third pet. You should then immediately charge your Wind-Up again. Gimmick the Wonderpet will burrow at the same time. Your speed buff will fall off when it is underground, which is great because, when it comes up, you’ll have a Wind-Up to the face to greet it! Sure the Burrow may kill your pet first, but that’s what the Mechanical Fail-Safe is for! Gimmick will likely hit you in the face with a ton of Elemental damage on its next attack, but its health will be so low that it kills itself in the process! 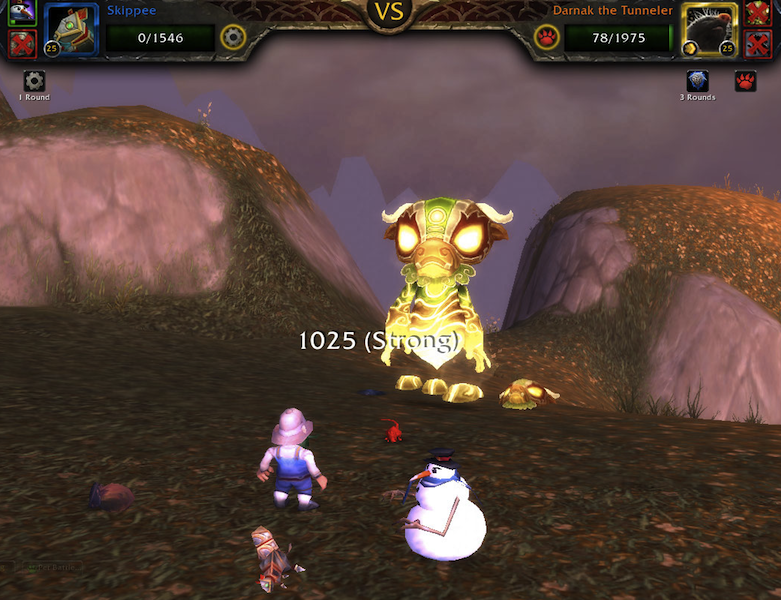 Screenshot your level 10 pet standing over three dead “Legendary” pets and collect your goodie bag! Go Frosty! It’s yer birthday! Go Frosty!